Cookery programme. Mary loves entertaining and creates some timeless classics. She visits Leeds Castle with florist Simon Lycett in preparation for the Festival of Flowers. I've been cooking for quite a few years now. So many recipes have come and gone. But there are wonderful classics that are as popular as ever. I'm just saving on the washing-up. I'm going to be helping with your school dinner. ..and some favourites from the past that are making a great comeback. And, most importantly, with almost no fuss. In this programme, ideas for timeless entertaining. and, of course, there'll be plenty of fresh flowers. ..and a beautifully simple pud that's my absolute favourite. a Scandinavian classic that never fails to impress my guests. For years, yonks, I've been serving gravadlax for special occasions. The classic gravadlax is with sugar, salt and dill. I'm doing a modern twist on it and using beetroot instead of the dill. I've got a piece of salmon here. and there are no signs of any bones there. It couldn't be more ready for curing. salt and a little pepper. Pile it on, all the way down. That's it. Now I'm going to wrap it up. turning the flesh a striking deep pink. and, in 24 hours, you have gravadlax. and an overnight stay in the fridge. Plenty of time to rustle up a punchy sauce to partner it. I love them. They go well with salads and very well with fish. And that gives a bit of bite in the sauce. Season and, for a final touch, add some chopped parsley. I can actually eat this by the spoonful. I can eat it neat. And it's quite hot, too. So just look at that - the fish is a bright, beautiful beetroot colour. without turning your fingers bright purple. What I do before I carve it is to take a little bit of clingfilm. You can see my hand is completely clean. You get this gorgeous bright colour on the outside. and the horseradish sauce - if there's any left. That's just as I want it to be. In fact, I'm very chuffed with it. Salmon doesn't get better than this. For me, entertaining isn't just about decorating the plate. huge floral displays will be created in its main rooms. of the banqueting hall - award-winning florist Simon Lycett. All ready to do something dramatic, I bet. OK, everyone, we've got a visitor. If I know Simon, it's not going to be a simple affair. We are creating an amazing tablescape. These are all British seasonal flowers. at creating your own arrangement with me. I'll watch you, and then I'll copy. Are there any sort of rules? I mean, say we're going to do this for the middle of a table. work one type of flower at a time and gradually build up. So establish your size and shape of your design as you start. Now, that's a really good tip. -..put those in first, and then fill in the gaps? do you remember we used to be told to hammer woody stems? Oh, yes. Roses - you used to have to hammer them. it's able to take up maximum amounts of water. make it so it looks pretty in every direction. Simon can use thousands of flowers for his extravagant pieces. It's a real eye-opener for an amateur flower arranger like me. and here I can crib exactly what you're doing. Any time, I shall come and give you a hand, Mary. I might swap it for a pie. Oh, well, I'm not bad at the pies. I need a lot of encouragement. I'm watching you! You're going far quicker than me. It's quite difficult to get those into the foam. -..for me just brings it all together. -And they need no attention. No attention. They're like florists and cooks - they thrive on neglect. Well, I don't. I like to be well looked after, and I am here. as a non-matched pair, we've not done a bad job, have we? I'm really rather proud of that. we're going to create at Leeds Castle. -Well, we've had a little practice, haven't we? and it was such a treat. I'd never tasted fish like it, and I've remembered it to this day. Once you've tasted heaven, you might as well stick with it. I have a beautiful Dover sole here. so that you really get the flavour of this beautiful, firm fish. so ask your fishmonger to do it for you. You can leave the head on or off. I'm going to take it off. and then just cut it off. so here's how to pan-fry it to perfection every time. Butter the fish rather than putting butter in the pan. and it will then melt over. And the flavour of butter is wonderful. That feels very, very hot. A couple of minutes each side. I can start to spread the second side with butter. Don't forget the tail cos that would stick. Just needs a few more seconds, and then I'll turn it over. It hasn't burnt. It's just that gorgeous, golden, nutty brown. Don't be tempted to overcook it because it's such a special fish. I'm really chuffed with that. gently melted in the lingering heat of the pan. Dover sole - the king of all the fish. I think that would be the start of a perfect evening. It's just for two of you, would be such a luxury. Of course, entertaining isn't just about romantic suppers. but I still love to make every effort. the setting. And it's the part that I really enjoy doing. I have the perfect dish to make them feel special, too. This one is just perfect, and the children love it. That's the thigh and the drumstick altogether. It makes a really substantial meal. Just knocked together in no time. First for the sticky part. Ketchup. Everybody's got tomato sauce in the cupboard. I'm going to judge it. So six tablespoons. Give or take, that's six tablespoons. Three tablespoons of Worcester sauce. That gives it a little bit of oomph. Then a couple of tablespoons of mustard. I like the grainy mustard. And it's pretty tasty so far. I've often got a jar that's solid at the bottom. Just warm it and it will be runny again. Now all it needs is the chicken. Just make four slits in total. Right. It all goes in. there are no hard and fast rules for this marinade. but it's got to be sticky and sweet. pop in the fridge and wait for that sticky marinade to work its wonders. hunt out your largest roasting tin. because it makes it easier to clean later. And spread them out in one layer. If you pile it up, they won't get crispy on top. Into the oven at 200 degrees fan for about 35 to 40 minutes. I think that looks amazing. I'm just going to test whether it's absolutely done. and make quite sure the juices there are as clear as a bell. pop it back in the oven for a bit longer. Pile those in. I think they look really, really special. The charred finish and the smell, so spicy and good. My sticky honey chicken is great for entertaining children. It's not too expensive, and it looks so good, and tastes even better. to an entertaining dinner or two. Look at that. Wow. Beautiful. in mist and floral form for the annual Festival of Flowers. Let's go and see what's what. with me as his helper, of course. Preparations are well under way for tomorrow's public opening. -It's enormous. Where are we? which, in two hours, we're going to transform. Well, you've a blank canvas. There are 22 florists taking part in the festival. enjoy all these magnificent displays. Simon and his team have designed a banquet table display. I'd better make myself useful. -I'll take that from you. Thank you. As you can see, there's quite a lot of carrying. And this is going to be a long dining table? Yes. Clothed in this gorgeous, sort of champagne-coloured taffeta. are going to go on the table all the way along, lined up. So before you start, do you draw this all out? No, it's in my brain. That looks very firmly on top. -You don't want it falling on somebody's head. -Give them a bit of a shock! and everything we do has to be very stable. where it was all greens, ferns and white orchids. And along the table it was bowls of Lily of the valley and hellebores. You would need an awful lot of Lily of the valley. We use an awful lot of everything. be it in food, candles, flowers and love. You mean a bit over the top? Of course. A LOT over the top! Spectacular tables need dishes that make a statement in themselves. And this one is just the ticket. with a little mild olive oil and sprinkle over some sea salt. So in goes the duck. That's it. Oh, it's a plump one. Sitting on the rack here, so that all the fat goes down below. Start it off in a very hot oven, 220 degrees fan for about half an hour. That's looking a good colour. But to get it extra crispy, you must keep basting it. and that will crispen the skin. and leave it for two and a half hours. The fat will drain down, and it will become beautifully tender. but it still isn't quite crisp enough for me. for a final 20-minute blast. But I promise you, it's worth it to get that really crisp, crunchy skin. If you want it perfect, that's the way to do it. Meanwhile, I can forge on with my delicious cherry sauce. in that glorious duck fat. then I'll add the other ingredients. A good old sizzle there. Followed by 300ml of chicken stock. And to give it a real rich boost, 150ml of port. I'm going to let it bubble away until it's reduced. I think it is time to take a peek at that duck. Let's see if it's crispy. It doesn't get better than that, does it? so that the steam escapes, and that skin will stay super crisp. Now to finish the sauce. This is doing very nicely. It's reduced by a third. I'm going to add a splash of balsamic vinegar to that. That all adds to the flavour. Oh, the smell is lovely. So this is very, very hot. just like making old-fashioned custard with custard powder. And that will thicken up at once. Says she, knowing that it will. There we are, look at that, then. Coats the back of a spoon, and really smooth. Not a lump in sight. ..and some salt and pepper. There's not much wrong with that. We'll put it all together now and serve it and carve the beast. This is such a sumptuous way to feed your guests. Well worth all the effort. It's just falling off the bone. and I'm not going to miss out on the cherry either. Can I get all that in in one go? I tell you, I'm going to. The joy of entertaining is making people happy. time and time again is my raspberry mousse. and push the pulp through a sieve. There's a wonderful fresh smell of raspberries coming through. And great joys, it goes through very easily. but you certainly would do if they were all left in a mousse. That's it. Don't miss out on any of those beautiful raspberries. I want every little scrap to get in that bowl. For a really light mousse, we need a lot of volume. So first of all, the egg yolks, and I've added 75g of caster sugar. So at the moment, that's bright yellow. And it'll become much lighter and I can do it on full speed. So the egg yolks and sugar are beautifully light and fluffy. In goes the raspberry puree. Isn't that a glorious colour? to give the mousse that added setting power. So in it goes. Just stir that in. That's it. Followed by some double pouring cream, just lightly whipped. The final lightness will come from four egg whites beaten until stiff. So fold that in until there are no flecks of white. and aim to get it right in the middle - no drips down the side. ..I must have a little taste. and it's just the thing to end a rather rich meal. Simon and his team have been working their socks off for hours. ready for the festival's opening tomorrow. This has been quite a journey, hasn't it? As you look around, you've blended all the colours together. but it really sets the whole table off, doesn't it? We're going to light the candles, so I can see the full effect. I'll do the little ones down here. I love lighting candles at the end of the job. and do you just stand outside and listen to what they say? It's quite nice hearing the "oohs". The oohs and the ahs. even down to the plates. Oh, this little posy is so sweet, isn't it? All sorts of little things. It's got some rosemary in, so it smells lovely. It fragrances the napkin, and they can take it home. Lovely. You're on the homeward stretch. I think this might well be our last one. So, Mary, come and admire your handiwork. and being absolutely dumbfounded by it all. anything like it in his lifetime. in the food and his women. Just look at that. Isn't that tempting? All in one go. ..no matter what the weather. -I think we'd better get out of this rain. Mary has always adored entertaining and pulls out some of her finest classics that will leave any guest begging for the next invitation - be it a romantic meal for two or hosting a big meal for friends and family. From her divine dover sole cooked to perfection, a genius way to make beetroot gravadlax and a sticky chicken recipe that will have them knocking down the doors, to an ambitious crispy roast duck and a simple but exquisite raspberry mousse. 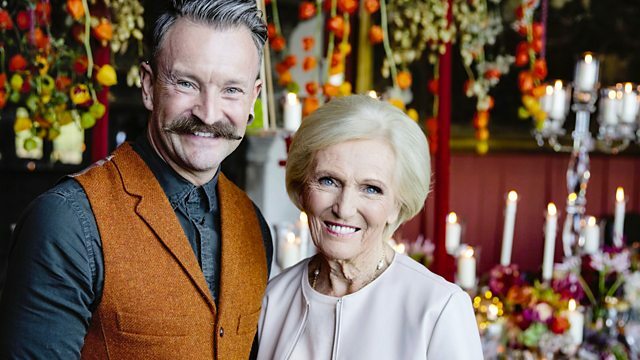 For a look at the extreme ways one can decorate to entertain, Mary travels to Leeds Castle with acclaimed florist Simon Lycett as he prepares for this year's Festival of Flowers. Bringing Henry VIII's Banquet Hall to life he shows Mary that too much is in fact never enough!